I've seen what dice-o-philes you people are. The gallery that got liked/shared and commented on the most from Gen Con? Shots of dice. Though those dice were nice, they did have one flaw: You couldn't change what was on them. Changing dice faces is the key behind Black White Dice, a new game coming from WizKids. I know, it might not sound thrilling right at the start. What with being "blank, white dice" and all. But them being blank is just where you start. 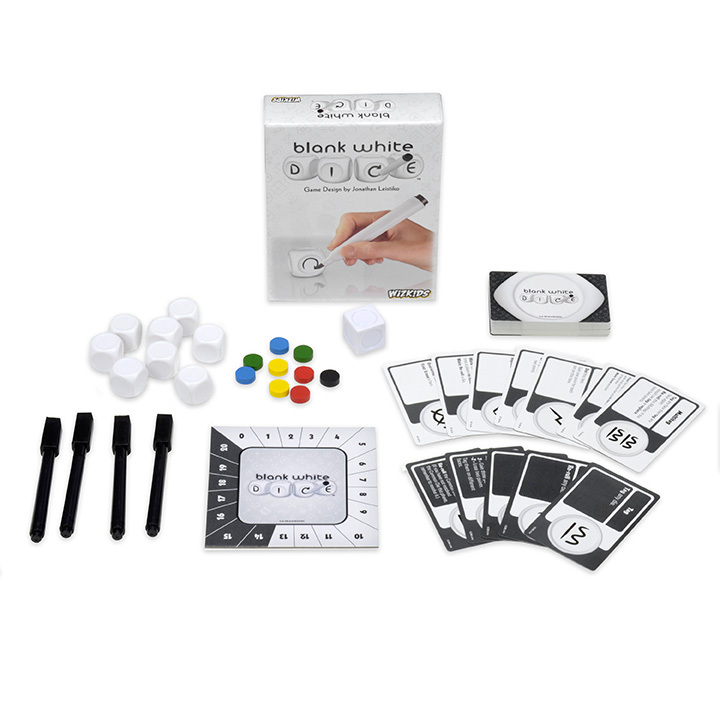 The game comes with markers in order for you to change the faces of the dice. With each roll of the dice, you're looking to gain points. If you roll a blank side, you can mark it with one type of symbol. Some symbols give points. Others take them away. Others will let you change other faces. Still others will give rerolls. There's over 50 symbols in the game, so there's plenty of options. Be the first one to score 13 points and you're the winner.